Custom Engine Building At Its Finest...! You REALLY want to know about me? My background includes being in the high performance engine industry for over 50 years. My regular customers appreciate the personalized service they get from me when they really need it. I started off in competitions doing the drag race thing for myself and a partner in Super Stock around 1970, (learned how to make the horsepower); then went on to the asphalt oval track in Late Model around 1982 to 1989, (to learn how to make that good horsepower live a long time); which gave me a desire to turn the car both left and right so, road racing in the GT-1 class in S.C.C.A. got my attention for the next 16 years. 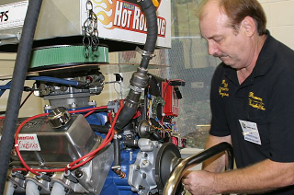 Now I use all that gained knowledge from all these sources when building my customer's engines to the best of my know-how, using the latest proven techniques mixed with "old school" reinforcements while giving my expertise in the component selection and doing modifications for my customers. They get all they can ask for; (and learn about some things they could never dream they would actually need to be competitive). I have entered some engines in few engine building contests along the way, (and done pretty well; on a small budget).